The following essay is one of Zenster's occasional contributions. What he has to say about a commodity more precious than oil is sure to give you pause for thought. We have a few readers and donors who work in this area. They lurk but don't comment, and I'm hoping Zenster's post will bring them out. At any rate, we have something to ponder here. California is having its own water issues and the drought map of the U.S. shows other problem areas. Australia has had more than its share of drought. Thus, it's an issue many of us have considered at a local level. Zenster goes global. While conflict over our world’s oil supplies dominated the closing decades of this last century, this new millennium will be greeted with far more pressing and volatile disputes about the increasing global needs for water. Some of the most hostile cultures and unstable political regions on earth are also home to severe Water Poverty. By the year 2050 world population is predicted to have increased by fifty per cent. Rapidly expanding Muslim Middle East populations already require their governments to divert agricultural irrigation supplies over into municipal reservoirs. This has forced the MME to become increasingly dependent on imported food. Dwindling aquifers and diminished annual water flows in major rivers exacerbate this situation. A majority of the significant global population increases are taking place in those areas most affected by Water Poverty. One equation calculates the annual depletion of global aquifers at 160 billion cubic meters (or 160 billion tons).Generally, it takes one thousand tons of water to produce one ton of grain. This 160-billion-ton water deficit is equal to 160 million tons of grain (or one half of the entire U.S. grain harvest). Per capita world grain consumption hovers at about three hundred kilograms - one third of a ton - per year. The foregoing aquifer depletion rate demonstrates the irrigation needed for 160 million tons of grain, an amount that would feed some 480 million people. Currently, almost half a billion humans, or nearly ten percent of the globe’s population, subsist on unsustainable water supplies. The world’s entire water supply contains only some 2.5 percent fresh water, of which less than 0.007% is available from surface sources such as lakes and rivers. Oceans cover more than seventy per cent of the earth’s surface but their content is not an optimal source of potable water. Current methods of desalination are not yet viable methods for extracting drinking supplies. At the moment, desalination represents the most expensive source of fresh water. Besides costing up to five times more than conventional sources and requiring ten times the energy to extract, there are also environmental issues to be considered. A huge portion of the ocean’s food chain exists at the microbial and microscopic level. The uptake pipes of a desalination plant cannot discern the contents of what they ingest. This means that large shoreline areas of vital ocean-borne nutrients are borne away. It was for this reason that NOAA banned krill harvesting along America’s Pacific coast. Krill (near microscopic shrimp-like crustaceans) are a crucial link in the oceanic food chain. They are a vital source of nutrition for vertebrate species, including whales, seabirds and salmon. This preventive measure by NOAA aims to protect baseline nutritional sources upon which the entire global food chain depends. One assessment of Southern Ocean life forms estimates that krill, along with their eggs and larvae, constitute over sixty percent of the average total zooplankton biomass. While a seemingly “green” technology, desalination processes have a dark side. The saline sludge left after purification is a nightmare of toxic wastes which present intractable disposal problems. Boron, algal residue (e.g., “red tide”) and endocrine disruptors are present in ocean water and remain in the sludge. Further, nuclear energy is one of the few viable methods of providing sufficient electricity for desalination. Nuclear power plants themselves require large-scale supplies of cooling water; their thermal outtake plumes can alter coastal ecospheres in a significant manner. Estimates for nuclear power plants’ problems cite that their intakes “kill at least 3.4 billion fish and other marine organisms annually”. One billion ocean-going microbes can fit into a single teaspoon, thus giving some perspective about the changes which would follow a catastrophic global collapse of the maritime food chain. There are no simple solutions. Throughout history human populations and their agriculture have remained dependent on adequate water resources. While the per capita grain consumption of largely vegetarian countries like India may dip as low as two hundred kilograms per annum, a Western diet rich in livestock, dairy and eggs can require up to the equivalent of 800 kilograms of grain. This is not about “typical Western overconsumption”: North America, with about eight per cent of the world’s population, possesses sixteen per cent of the global water supplies. Europe’s situation is almost reversed: its percentage of the world’s population is now thirteen per cent yet it has access to only eight per cent of the water. Asia contains sixty per cent of the world’s people, with a meager thirty-six per cent of the water. This hard fact sets the stage for some truly ominous prospects. India and China have already begun massive hydroelectric projects which could disrupt the health of ecologies and populations in a large number of downstream locations. The Mekong River is one of the world’s largest watercourses. Whoever controls it has a strong lever which can be used on countries in the Lower Mekong Basin. Over sixty million people rely upon the Mekong River for food, water and transportation. 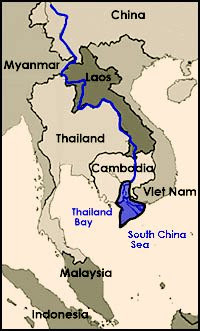 Laos, Thailand, Cambodia and Vietnam all depend upon the Mekong River to varying degrees. Overall flow control could serve to mitigate rising monsoon flood waters and redistribute those retained supplies during droughts. However, if the Chinese have control of the spigot there are the prospects of untimely releases (which could wash away entire cities), or a withholding of flow (collapsing whole ecosystems). For example, Cambodia’s Tonlé Sap (Cambodian for “Large Fresh Water River”) is the largest lake in Southeast Asia. It is also one of the most productive inland fisheries in the entire world. The Tonlé Sap exhibits a unusual property: it changes the direction of its flow. This feature allows the lake bed to serve as a safety valve during flood seasons while it can also accumulate nutrient-rich sediments carried by the Mekong River. This aquatic region supports over three million people, provides seventy-five per cent of Cambodia’s inland fish catch and sixty per cent of Cambodians’ protein intake. Such figures demonstrate the singular role of just this one feature along the Mekong River. Outflow from this massive inland lake accounts for about fifty per cent of the Mekong Delta’s capacity as its runs through South Vietnam. China’s construction of dams on the upper Mekong threatens the strength and volume of reverse flow into the Tonlé Sap and thereby places Cambodia and Vietnam at potentially severe risk. History has taught smaller nations that the goodwill of larger neighboring countries is not reliable when it comes to vital resources. China’s overall track record does not inspire confidence for those along the Mekong River. While the smaller surrounding nations are reluctant to antagonize China they remain deeply concerned about the fate of their own economies as control of the Mekong River ends up in China’s hands. A more imminently explosive situation is gathering steam in the Karakoram Range above Pakistan and India. There are elements within Pakistan prepared to launch a nuclear war over the issue of water rights shared by both nations. Although regulated by the 1960 Indus Water Treaty which provides for India’s use of the Rivers Indus, Jhelum and Chenab, Pakistan may choose this conflict as an excuse to create an international crisis over water use. Once again, hostile and aggressive nations often generate intense discord using access to water as the catalyst for war. In the case of Pakistan, water poverty is self-inflicted. Monsoon rains and snowmelt provide an almost unlimited water supply. Each year the Indus River runs with about 170 MAF or Million Acre Feet (one acre foot of water equals 325,851 gallons). In comparison, that amount is ten times that of America’s Colorado River and three times that of The Nile. Between 1858 and 1947 the British Raj oversaw construction of the river link canal system in what would become post-partition Pakistan. However, early military adventures in Afghanistan and Kashmir were allowed to overshadow water management issues and the end result has been an ongoing annual shortfall of ten million acre feet. Rather than take responsibility for its negligence, Pakistan blames India (which has a much more proactive water management program). The blame game allows Pakistan to appeal to the global community, asking it to apply pressure on India, knowing that India has a much larger economy and thus is more easily subject to coercion. Using the threat of war, Pakistan inspires insecurity and fear. At the same time it diverts attention away from its own incompetence and lack of stewardship. Belligerent blackmail of the sort used by Pakistan is an increasingly common tool for failed nation states as they try to cover their tracks regarding disproportionate military spending and consequent neglect of their internal economies. Iran is a good example of this neglect-aggression tactic. Its near-total economic collapse can be traced back to massive over-investment in the nascent nuclear weapons program. This tunnel vision operates to the detriment of maintaining its petroleum extraction industry and its domestic food production. Iran recently eclipsed Japan as the world’s largest importer of wheat. Overall, the MENA (Middle East North Africa) region is the world’s fastest growing importer of foreign-grown wheat. The water required to irrigate domestic grain and other foodstuffs would equal the entire annual flow of the River Nile. Thus, for regions experiencing Water Poverty, importing wheat is the equivalent of importing water. There also exists the issue of how water is utilized. For example, in the case of India, using 1,000 tons of water to raise one ton of wheat brings an Indian farmer only around $200. But that same amount of water can be used to expand industrial capacity by $10,000 or fifty times as much value. But this doesn’t address the profound internal security issue of any nation’s ability to become self-supporting domestic food producers. As Water Poverty spreads, an adequate water supply, and thus food security, will begin to overshadow energy security as a prime concern for individual governments. While the vast majority of water-poor nations are not in a position to wage war upon their water-richer neighbors, the discrepancies are sure to spark unrest and conflict. Five previous decades have seen 1,831 disputes over water rights. While it is encouraging that 1,228 of these disagreements did not result in armed conflict, it is very telling that 18 of the 21 situations requiring military resolution occurred between Israel and her Arab neighbors. All of this lends even greater urgency to the necessity for dealing robustly with hostile and aggressive Islamic regimes in the MME. Proliferation of atomic weapons proceeds unabated, bringing with it the distinct possibility that future MME water conflicts may be resolved by resorting to nuclear war. Since some of the world’s largest aquifers straddle national borders, conflict is inevitable. A UN study cites some 23.4 million cubic kilometers sequestered in underground aquifers. This amounts to five hundred forty seven times more water than all of the earth’s rivers combined. For instance, the Guarani aquifer in South America could furnish our planet’s current population with almost 100 liters of water per day for the next 200 years. The Nubian Sandstone aquifer in Northern Africa holds 500,000 times the River Nile’s annual flow. Unfortunately, it is not replenished by the scant rainfall in the region. More over, the energy needed to transport this aquifer’s water around the world far exceeds the value. Aquifers are also rather delicate constructions. The water in many of these underground reservoirs is over one million years old; their natural replenishment can be a very slow process. The Nubian Sandstone aquifer, since it is not replenished, becomes a one-time source of supply. Overdrafting, or overpumping, of aquifers can produce dramatic disturbances in local geologies. Known as “ground subsidence”, the shifts in geophysical stability when aquifers are accessed can manifest as compaction, or an actual lowering of the land surface. Although such surface effects occur gradually, they cause significant alterations in topography. They can appear as changes in the slope or elevation of streams or canals, cause damage to bridges, roads or railways and even compromise buildings or other large structures. These surface effects are not limited to localized damage. One extraordinary fissure in central Arizona is over ten miles long. Low-lying coastal regions can undergo subsidence in low-lying coastal regions can cause them to be inundated during high tides. Overdrafting of coastal aquifers can also result in saline intrusion of ocean water into normally potable supplies. Palestinians living in the Gaza Strip have experienced this problem. The population density, approximately 3,500 people per square kilometer, has resulted in overpumping the Coastal Aquifer at a rate of 68-90 MCM (Million Cubic Meters) per year. This excessive use has increased the rate of saline intrusion from Mediterranean seawater. It has also inhibited the dilution of anthropogenic (human origin) waste water entering the aquifer. The result has been brackish drinking water with elevated concentrations of salt, pesticides and human waste, making it hazardous for human consumption. In the self-defeating tradition of so many hostile and aggressive nations, the Palestinians (and their democratically elected terrorist Hamas government) intentionally diverted donations of metal piping destined for sewage management and waste water control over to the construction of rockets which have been used to bombard Israel for many years. Even Mahmoud Abbas described the rockets that are being launched as the “pipes” that provided Israel with an excuse to carry out military operations in the Gaza Strip. “Our people don’t deserve these tragedies,” he said. “If these pipes provide an excuse, it’s time to stop using them.” Yet the rocket attacks upon Israel were kept up and diversion of this municipal resource continued until it resulted in the breaching of several sand-diked effluent ponds that created a sewage tsunami (warning: graphic images in this video show huge sloughs of despond), drowning five Palestinians in Um An Nasir in Northern Gaza. It is these same hostile and aggressive nations which continue to exacerbate their own Water Poverty by not adopting modern methods and technologies that conserve use. Too often, these countries are riddled with corruption that just as frequently sees substandard civil engineering or a total absence of the infrastructure needed to alleviate Water Poverty. It is these same hostile and aggressive nations that will most quickly resort to military force in order to solve the problems they created in the first place. Continued high birth rates in these regions of Water Poverty may eventually overwhelm the ability of grain-producing countries to meet their needs. The expanding demand of population giants like China and India could simply outstrip the production of grain exporting countries like The United States, Canada and Australia. The repercussions of such supply-side defaults could be tremendous. A country that lapses into hydrological poverty will find it a local form of poverty which offers little chance of escape. It should be remembered that while a person can go without food for weeks, it is difficult to survive without water for more than several days. Humanity survived without gasoline for almost a million years, but we now find ourselves expending thousands of lives and trillions of dollars to protect the West’s access to oil. Giving up personal automobiles might seem onerous but imagine what would happen if the water taps ran dry. How much more fierce will be the battles fought over water? Finally, Islam’s continued hostility towards the West may eventually bring water wars to an unimaginable level of confrontation. If the number of terrorist atrocities escalated in the West, we could see a complete halt of wheat exports to the MME by grain-producing countries. The United States, Canada and Australia continue as targets for Muslim hostility. Should they band together for protection and unanimously halt deliveries of grain to the MME, mass starvation could set in within less than a month. Being net food importers, the triangulating actions of China and Russia would be unable to lend anything but brief assistance to terrorist states. Western nations do not have the luxury of sitting back and allowing Muslim majority countries to discover on their own just how misguided and incompetent their antagonizing of non-Islamic nations has been. Proliferation of nuclear weapons within the MME specifically and the spread of Weapons of Mass Destruction in general will not permit any sort of “wait-and-see” attitude. All of this militates towards some unpleasant outcomes. It is now recognized that the World War II nuclear attacks upon Japan ended up saving a tremendous number of lives, Allied and Japanese alike. Would there ever come the time when a Western leader refuses to retaliate against the MME by imposing starvation and instead views nuclear strikes as more humane? If, accompanied by economic implosion, some unforeseen drastic shortfall in domestic grain supplies due to drought or crop failure were to occur it could come to such Hobbesian choices. Even as it stabs at the West, the MME is itself perched upon a razor’s edge of survival. Islam continues to justify terrorist atrocities against the very countries that feed it. This hostility is short-sighted; it could well result in the erosion of tolerance for monumental ingratitude. Those Islamic leaders who have driven their respective populations into this existential box canyon may end their final moments as Mussolini did. Thank you, Dymphna and The Baron for publishing my latest essay. Such a generous donation of bandwidth is greatly appreciated, as is your editorial contributions. Again, thank you very much for your kind assistance. I can only hope that the Gates of Vienna community will benefit from this publication. Muslims will always employ the most devastating of all weapons, given the opportunity, use the most barbaric forms of torture or killing, to break the morale of the Infidel. If OTH, the same was threatened against them, or acted on, they will immediately raise the cry of being victimised. It is this two-faced duplicitous nature of the enemy, one that is totally impervious to cries for mercy when in the ascendent, but imploring mercy, when defeated, reminding Hindus of non-violence in Hinduism, or Christians of Christian charity and tolerance, that has allowed Muslim depredations not being punished properely. Saddam Hussein for instance, did think of using chemical weapons against the Allies in GWI. However, given the nature and capability of the enemy (USA, UK, France), decided, that in this case, it would be sensible to desist. Water wars has been predicted for some time now. So far, this impending conflict has been masked by other issues. For how long though? Desalination, like most other teknologies ,can be either a blessing or a curse. In Israel we are well underway to solving the local watwerproblem by building a series of desalination plants. The Ashkelon plant is for now the worlds biggest and most advanced DSP,try to google it. Today about 10% of consumption i covered, this will level out as 35-45% somewhwere around 2030,give or take a war or two. The returnflow of brine only RETURNS to the sea what was there naturaly. The prefared energy source is natural gas, which now is avaiable most places. Even if 45% desalination is reached, the energy consumption will be only a few % of total elektricity demand. Hopefully solar power will become competitive to fossil fuels in the next decades, and will then contribute up til 60% of total elektricity demand, whithout any specific connection to desalination. The Ashkelon plant is capable of producing water at o.62$ a cubic meter, which is less than peoblepay today in Tel Aviv for water from other sources. In a too-hot-and-dry cimate the cost of desalination should be seen as paralell to the increased costs of HEATING in a too-cold-cold and wett climate. An interesting contribution, particularly in regard to the environmental effects and costs of desalination. In Australia Desal plants are proposed or under construction for most of our major cities.Because of the worst drought in our history, there appears to be no alternative to the sea as a source of water. Doesn't China have more leverage than you suggested since the Brahmaputra,Ganges,Salween and Indus all originate in China or Chinese controlled Tibet. The Chinese government appears to be prepared to "do a Mekong" on these rivers as well. In the case of Pakistan, water poverty is self-inflicted. Monsoon rains and snowmelt provide an almost unlimited water supply. Each year the Indus River runs with about 170 MAF or Million Acre Feet ..... Between 1858 and 1947 the British Raj oversaw construction of the river link canal system in what would become post-partition Pakistan. However, early military adventures in Afghanistan and Kashmir were allowed to overshadow water management issues and the end result has been an ongoing annual shortfall of ten million acre feet. Aside from ending dysfunctional military confrontation with India, what specific actions - 'taking responsibility for its negligence'- would an enlightened political leadership in Islamabad undertake to productively address this specific circumstance? All the more reason to limit immigration to the US. Excellent and informative article. This is something I have thought of before myself. One of the things we are blessed with here in the Northeast is an abundance of fresh water. This whole cool, wet, non- Spring and Summer has panned that out. Now if we can just get rid of the Liberals. I heard someone on talk radio speaking of "Water Refugee's" in North America (Mexico, and the Southern US) could eventually turn Canada and the northern half of the US in major population centers along the lines of "Soylent Green". He was a "Global Warming" proponent however. Interesting though. Mace, my brother who migrated and now lives in Melbourne tells me all the time about water restrictions and how the drought is going - he married a farmer's daughter from Goulburn in NSW, I have been there many times over the years - not even enough for the sheep now to graze on. DP111: So far, this impending conflict has been masked by other issues. For how long though?. My own guesses would center on cost of extraction (i.e., drilling wells, desalination or purification) and, as noted by ole, the price of transportation. As the overhead associated with obtaining and delivering water continues to rise it will exert the greatest economic pressure upon Third World nations. It is in these nations where the most dangerous accelerants converge. Population growth, lack of existing infrastructure, corruption and Water Poverty itself are the four horsemen that will most likely drive conflicts. All by themselves population growth and Water Poverty create a vicious scratch itch cycle. As noted in the original article, population growth frequently coincides with areas that have the least water resources. This is what has driven dependency upon external food supplies in these countries. Lack of existing infrastructure is another serious issue in that there is no alternative for distributing this liquid asset. An example would be how India―through its use of cellular phone technology―managed to avoid the massive wiring investment faced by many earlier arrivals to the telecom market. No such work-around exists for water. The cost of delivery by pipe or canal cannot be undercut by any other combination of rail or truck-based transport. The historical option has been localized extraction via well-heads or direct sourcing from rivers and lakes. Seasonal flow aspects of direct sourcing introduce supply fluctuations that cannot always sustain large urban populations. A conventional solution has been to augment surface supplies with deep drilling into aquifers. The relatively low cost of aquifer-based supplies is deceptive as overdrafting continues to deplete these sources at unsustainable rates. This is where corruption and mismanagement come into play. The high cost of installation and need for reliable operation make large-scale piping systems unmanagable for places where corruption is endemic. Such projects are irresistible plums that all too often get pared down by graft to the point of being inoperable. If piping is not installed properly, it leaks and creates an automatic cost burden to all future operations. In order to be reliable, expensive pumping stations require routine maintenance and any breakdowns can cause devastating interruptions in supply. Water treatment and purification only complicate the operation of such utilities and all of the foregoing are sensitive to the typical cut-corner approach found in corrupt cultures. Third World nations are typically plagued by lack of education and a history of regional hostilities that reduce the efficacy of diplomatic resolution for such problems. This inelegant pairing is a primer for military conflict. Factor in the high cost of effectively resolving Water Poverty through infrastructure and the stage is set for water wars. The most significant variable is how willing are individual countries to disregard ethical resource management and use unsustainable methods that irreversibly deplete critical supplies like aquifers and lake systems. China's phenomenal economic growth has relied upon totally unrealistic release of pollutants that have had a global effect and adversely affect health throughout the region. Like China, many small countries will find it convenient to ignore good stewardship of their resources in favor of temporary stability and the short term benefit for those fragile political regimes that govern them. This will foster the occurrence of even more severe environmental crashes. While foreign aid may mitigate these eventual collapses it cannot avert them entirely. The only question is "when" and not "if". As continued weapons proliferation opens a window of regional and global instability, Water Poverty may well provide the spark to ignite nuclear wars. It is no coincidence that these two dangerous developments are following a parallel track. If both continue unrestrained, another ten years may be all that is needed for water wars to erupt. By that time, corrupt economies will have exhausted their most convenient water resources and many of these same regimes will have only acellerated the process by diverting much needed capital into weapons development programs instead of sustainable infrastructure. Both Pakistan and Iran are picture perfect examples of this process. Pakistan is rushing to fill the water resource gap created by so many years of overinvestment in its military. Iran is a far more worrisome situation in that it has redirected so much money away from its principal source of income through petroleum extraction. Nothing embodies this more than how Iran―a major oil producer―is devastatingly dependent upon imported gasoline. Its status as a sponsor of international terrorism has rendered Iran a pariah state that is subject to technology restrictions and lack of foreign investment. This has contributed to a gradual decline in refining capacity and overall production. All of this has been further complicated by a catastrophic program of self-sufficiency instituted by President Ahmadinejad. Moreover, the foregoing all combines into a far more volatile situation due to the heretic status of Shi'ism, Iran's notoriously belligerent nature and the apocalyptic aspects of "Twelver" theology. This singular combination of negative factors point to Iran as a potential flashpoint. Fate also has a few wild cards up its sleeve. The presence of cellular telephones and increasing connectivity in Third World countries may contribute to popular discontent over poor resource management. Much as how the Internet's distribution of information helped bring about the Soviet Union's downfall, so may it help in collapsing what are already unstable regimes. None of this alters the looming danger of military hostilities over water. However, a more speedy ejection of dishonest players from the field may help reduce the possibility of these conflicts going nuclear. The study of Zenster is a good piece and well structured and with good facts and hard facts. I disagree with his linking into the subject the subject of nuclear war which I find is a fascination with him in many of his postings. DP111's own agenda fueling it does not help especially posting an item and adding the nuclear word himself. Editors of newspapers in developing countries are radical but even there limits exist. Wars can start from such conflicts, around 1983-4 a conflict over the damming of rivers by India to fill a vast desert were orchestrated by Hindu Nationalism though not water necessity, knowing full well it would distrupt if not cause a catastrophe for Bangladesh downriver. Nepal threatening the same in retaliation to India stopped it but with huge threats against both smaller and weaker countries. The chances for conflict over water of course boils down to those countries that share resources. Australia shares no border and in a horrible drought they are rethinking priorities. Morocco were I live is doing the same because of mismanagement in the southern area of Terroudant in that they unwittingly emptied the watertable for the first time in its history and the fruit and vegetable exporting region is now working out how to refill it. But the country shares minimum water connection with Algeria or Mauretania to have conflict. I see political conflict in eastern Europe that will grow more strong with the use of potable water, old-style soviet era factories poluting the Danube being a great example, Georgia making the entire Black Sea unusable and so on. Zenster, a good article, personally I think you should avoid political agenda from what is a very good academic piece, I give you 7 out of 10 for it, take out the nuke theory and it would be a sure 9. Point to make clear: my reference to "DP111's own agenda fueling it does not help especially posting an item and adding the nuclear word himself." is his linking the nuke statement over water. ole: The Ashkelon plant is for now the worlds biggest and most advanced DSP [De-Salination Plant]. According to the latest statistics, Saudi Arabia's Shoaiba facility―at 150 million cubic meters per year―outranks Ashkelon's capacity of 110 million cubic meters per year. Ashkelon does have the disctinction of being the world's largest RO (Reverse Osmosis) desalination plant. The Shoaiba facility employs MSF (Multi-Stage Flash) distillation which is far more energy intensive. Reverse Osmosis needs about 6 kWh of electricity per cubic metre of water (depending on its salt content), while MSF and MED (Multiple Effect Distillation) require heat at 70-130°C and use 25-200 kWh/m3. Saudi Arabia's status as a bulk oil producer allows them this luxury. Some of the apparatus is massive. By comparison, the Ashkelon plant relies upon much smaller and easily replaced components. The return flow of brine only RETURNS to the sea what was there naturally. This may be the case but that does not address the possible boost in salinity near the point of discharge. Regardless of the method used, there is always a highly concentrated waste product consisting of everything that was removed from the created fresh water. This is sometimes referred to as brine, which is also a common term for the byproduct of recycled water schemes that is often disposed of in the ocean. These concentrates are classified by the United States Environmental Protection Agency as industrial wastes. • on the way to the membranes the feedwater is treated with an antiscalant (phospinocarboxylic acid) at a rate that depends on the quality of intake water – in this case it was forecast at about 4-6 mg/L. The antiscalant is discharged with the brine. The product water is then treated with lime to bring its acidity into line with drinking water standards. The above represents a veritable pharmacy of chemical agents needed to main the filters of an RO facility. The Ashkelon facility boasts of an impressive 99.9% reduction in salinity. However, they does not indicate exactly what is the salinity of the discharge water. Ocean environments, especially coastal regions, are very sensitive to changes in salinity. This makes me very cautious about how beneficial desalination technology may be. Admittedly, if all you have to drink is seawater, then some sort of distillation will be needed. It just seems that there are a lot of unintended consequences awaiting bulk use of these methods. mace: An interesting contribution, particularly in regard to the environmental effects and costs of desalination. Thank you for the positive feedback. I hope that the added information about desalination in my previous comments will be of assistance. Although my own research didn't turn up mention of those other possibilities, I certainly would not dismiss them. China faces some severe Water Poverty, especially with respect to food production in its northern areas. In light of how badly China continues to pollute the environment it is no surprise that acquisition of control over major water resources is one of the politburo's top priorities. Vigilante: A very informative piece of writing here. I'm glad you found it to be of interest. Aside from ending dysfunctional military confrontation with India, what specific actions - 'taking responsibility for its negligence' - would an enlightened political leadership in Islamabad undertake to productively address this specific circumstance? To some extent Pakistan is already addressing its water shortfall. Blame is to placed on Islamabad for over-spending on military hardware as opposed to infrastructure. Last year, the World Bank provided $297.4 million for use in water projects. Curiously enough, a Google search turns up no significant project launches in the last year. Obviously, dam and reservoir construction should be top priorities. Islamabad is particularly at fault in that it has spent untold billions preparing for large-scale war with India while disregarding to the point of malign neglect its need for well-trained troops and the equipment required to put down various fundamentalist and terrorist factions that contribute to Pakistan's instability. It has been Islamabad's over-reliance upon various territorial militant organizations as de facto armies being used to conduct low-level wars against India, Afghanistan and Kashmir that has led to this problem and its spillover into global terrorism. There is also not a lot of benefit from having prepared for war with India. India's vast land mass could easily absorb the entire inventory of Pakistan's nuclear arsenal without suffering total devastation. The opposite is not at all true. India's nuclear weapons could reduce the entirety of Pakistan to hot smoking glass and probably leave some left over to bounce the rubble a second time. Thus, Pakistan has spent untold billions preparing for a war it cannot win and most certainly does not want to start. This is direct result of Muslim preference for "strong horse" or "strong man" type governments whose external image is often tied to military might instead of good leadership. Solkhar: The study of Zenster is a good piece and well structured and with good facts and hard facts. I disagree with his linking into the subject the subject of nuclear war which I find is a fascination with him in many of his postings. It is not a "fascination" but a deep and abiding personal concern for how numerous Islamic groups all advocate or seek to use nuclear weapons against the West. Iran's bellicose language about wiping Israel off of the map is a prime example of how destabilizing an Islamic nuclear race could be. Pakistan's shaky grasp upon its own nuclear arsenal is something that could result in it becoming the object of a first strike should those weapons fall into terrorist hands. More than anything, it is Islam's aggression upon the West that continues to bear the greatest possibility of leading to a nuclear conflict. No other global hostilities approach this same level of destabilizing influence. The only measure that bears any promise is to confiscate or otherwise disable all nuclear weapons and facilities in Muslim majority countries. By doing so, the otherwise looming prospect of a Muslim holocaust might possibly be avoided. Unfortunately, it would be irresponsible in the extreme to disregard how closely parallel the approach of both devastating Water Poverty and a potential nuclear confrontation happens to be in or around the MME (Muslim Middle East). Arabs are notoriously incompetent at fielding modern armies. While Iran may be a Persian country, it nonetheless displays a vast majority of similar shortcomings in how it handles military matters. In possession of nuclear weapons, Arab leaders might find the decisive nature of a first strike to be simply too irresistible. Pakistan's continued nuclear saber rattling demonstrates the imprudent aspect of unstable Muslim governments being in possession of atomic weapons. It is no small coincidence that the greatest potential threat of nuclear war derives from Muslim majority countries. That Water Poverty is a part of that calculus makes it imperative to examine any potential links. I do not have an agenda to link water with nukes. That was pointed out by Zenster in his article. It merely confirms what is known. I think it was at the time of Pakistan's invasion of Indian Kargil, that a Pakistani general was quoted as saying, that he would accept the total annihilation of Pakistan in exchange for the total annihilation of India, in a nuclear exchange. This was not some ordinary person, or anyone at a blogsite, but a general in authority in Pakistan. And as you well know, the military carries huge influence in that country. His reasoning was that as most Hindus lived in India, its destruction would eliminate virtually all Hindu idolators, while leaving safe the bulk of the Muslim population in the world. The same reasoning can be seen in past threats to Israel by Iran. Well lets hope its only threats, though made by persons who are in some authority. I never can make up my mind where Iran's nukes are going to point to, in the event of Iran acquiring them. It was said in half-jest perhaps, that France's nukes were pointed at Germany. Could it be something similar with Iran. Shiite Iran has a blood fued with Sunni Islam since its inception. As Pakistan, a Sunni nation, allied to Saudi Arabia, has nukes, it does not surprise me that Iran would like to have them to deter any aggression. Of course the way to weaponise without thoroughly alarming the rest of the Sunni Arab world, was to proclaim that they were for deterring Israel. Despite Iranian protestations, Saudi Arabia seems to think otherwise. There are reports that SA will turn a blind eye to Israeli warplanes on their way to Iran. PS: It has been a glorious day today, and I have been hard at work in the garden. I'm really tired. Have posted a bit on "Reversal is Possible" thread. It is good to see Conservative Swede back again. We are in a Looking Glass war, where none of the normal rules apply. Stated objectives by the President or the PM, with utmost seriousness, looking straight at the camera, are simply Spin. Even what they count as victory, is not what it appears. You may also notice that there no body counts in the Afghan war. War is deception I know, but in the instant electronic media world we live in, it has also become transitory. Last minute's truth is this instants Spin. This is all very strange. So much better and clearer to read Churchill on WWII. Quoting political leaders, generals and the like in countries with a mostly low education or iliterate population always talk tough, that is to be expected. If the educated in those countries can see the difference, they always ask themselves how come so many in the educated West take this verbose language so literally? Pakistan in fact does not Nuclear saber-rattle and the sub-continent are just as aware of the fact that they are not for real use and Pakistan got it because the illiterate masses demanded it since the Indians have it. Nothing more. I believe even if overrun by conventional forces, Israel in the end would not condemn the Jewish State to being the spoiler who released the plague of destruction. It is true though that nukes in the hands of militant extremists is a global concern - that is for certain. DP111: His reasoning was that as most Hindus lived in India, its destruction would eliminate virtually all Hindu idolators, while leaving safe the bulk of the Muslim population in the world. The same reasoning can be seen in past threats to Israel by Iran. I'm really hoping that you have a cite for the above statement. I've just spent 15 minutes searching on Nawaz Sharif and General Ashraf Rashid to see if I could turn up something. What you suggest has some really serious ramifications and I'd enjoy seeing if there's some way to verify it. DP111: I never can make up my mind where Iran's nukes are going to point to, in the event of Iran acquiring them. That's what makes Iran's potential acquisition of nuclear weapons so dangerous. It would be like the dog that finally catches the car its been chasing and asks itself, "Now what do I do?" It is now revealed that during the 1999 Kargil incursion, Pakistan had readied their missiles for launch. Who knows exactly how many times Pakistan has brought this region to the brink of nuclear war? Does anyone think that things would be different with Iran? If anything, Iran poses even more serious issues that relate to the apocalyptic nature of "Twelver" doctrine and how its putative messiah will not emerge until Iranians are at the brink of total disaster. Moreover, while Pakistan and Iran are both active sponsors of international terrorism, Iran does not make any pretense about having a secular government like that of Pakistan. Tehran's more solidly integrated terrorist structure poses a far greater threat. On many previous ocassions I have observed how there is a certain numerical limit to the number of nuclear weapons in Islamic hands beyond which there emerges a non-zero probability that one or more of them will be diverted to the cause of global jihad. The volatility and bellicose nature of Iran's overall disposition only tends to lower that numerical limit and increase the probability. A nuclear war between India and Pakistan could cause one billion people to starve to death around the world, and hundreds of millions more to die from disease and conflicts over food. ... Helfand points out that the world is ill-prepared to cope with such a disaster. "Global grain stocks stand at 49 days, lower than at any point in the past five decades," he says. "These stocks would not provide any significant reserve in the event of a sharp decline in production. We would see hoarding on a global scale." ... In his study he attempted to map out the global consequences of India and Pakistan exploding 100 Hiroshima-sized nuclear warheads. ... Countries which import more than half of their grain, such as Malaysia, South Korea and Taiwan, would be particularly vulnerable, Helfand argues. So, too, would 150 million people in north Africa, which imports 45% of its food. Many of the 800 million around the world who are already officially malnourished would also suffer. This pretty much demolishes any question as to why Water Poverty and its influence over global food supplies should not also be linked to the discussion of even a limited nuclear exchange. Solkhar: Quoting political leaders, generals and the like in countries with a mostly low education or iliterate population always talk tough, that is to be expected. It is long past tea to begin taking the public statements of Islamic leaders at face value. Your plea to disregard such widely broadcasted exhortations for violence against the West and Israel ignores how such pronouncements serve as triggers to promote even greater donations of zakat that help to drive global jihad. We will leave unexamined the jihadist recruiting power of such speeches. Furthermore, the Islamic utopias where such hostile proclamations get aired are the least accountable in terms of where all those tithing monies end up. This makes the anti-Western propaganda being spewed in Muslim majority countries potentially more dangerous than that which is slid under radar in Europe and America. If the educated in those countries can see the difference, they always ask themselves how come so many in the educated West take this verbose language so literally?. None of which explains how frequently it is that well educated Muslims in Western countries actively carry out Islamic jihad. Take, for example, the attempted Glasgow airport bombing and Tiger Tiger Club car bomb. Mind you that the airport attack was specifically timed for when parents and their children would be massed for summer camp departures and the like. The Tiger Tiger Club was crowded with some nearly 600 people at the time. The club bombing attack was foiled by the singular courage of a common fireman who dismantled the nail-studded propane canisters, most likely even as the perpetrators were dialing it up on their cell phones to detonate it. In fact, five doctors in all were indicted regarding this plot. All of them highly educated and yet you have the temerity to lecture us as to how "the educated in those [Muslim] countries can see the difference". I was unable to find the link. The incident was at the time of the Kargil war. Your comment of Pakistan using nukes to blackmail India, jogged my memory of something similar. How then can one confront such an enemy, with such a view of life and death? Either we shake one another's hands in joy at the victory of Islam in the world, or all of us will turn to eternal life and martyrdom. In both cases, victory and success are ours. I wish I had saved the link, but the Pakistani general was quite clear, that in death, Pakistanis(Muslims), would go to paradise, while Hindus would be consigned to hell. In addition, the main bulk of the Ummah would be quite safe in this world, while the bulk of Hindus and the historic land of Hinduism i.e., Hindustan, would be finished. One sees from Khomeini’s statement, how such mindsets are formed. It was this that made me realise that the MAD doctrine, mad though it was but preserved the peace, would not work with the Islamic mindset. The question is present in greater urgency – what should Israel do? The premise of the Iran’s nuclear blackmail rests on the assumption that a nuclear strike will destroy Israel and a considerably fraction of the world’s Jews. Any counter-strike by Israel on Iran, will still leave the bulk of the Muslim population in the world unharmed. It is doubtful if Israel has second-strike capability, though it says it has. But even so, it is of no importance, unless Israel changes its deterrent doctrine. It is unlikely that the USA of Obama will threaten MAD to the entire Muslim world, thus MAD does not work as a deterrent. DP111: It is doubtful if Israel has second-strike capability, though it says it has. But even so, it is of no importance, unless Israel changes its deterrent doctrine. This is the source of Israel's rumored "Samson Option", wherein a single WMD strike would result in massive retaliation. With an estimated 60-85 nuclear devices in its arsenal, Israel could easily obliterate the entire MME (Muslim Middle East). While our erstwhile resident Muslim, Solkhar, doubts that Israel would demonize itself through such an act, what would be left of Israel to demonize and what better lesson to teach Islam about the price of genocide? Recent events in the Arab world have also led to speculation that Muslim majority nations around Iran may be less than happy with Ahmadinejad's perpetual saber rattling. In a 2007 letter, Saudi King Abdullah is quoted as telling Ahmadinejad, "Take heed, or face the consequences of your nuclear programme alone". This easily could be due to increasing Arab anxiety that Iran may bring a rain of death upon the entire MME. In this case, a significant portion of Islam, especially its elite Arab core, would perish alongside Israel. At present, no. BHO is in no way competent to deal productively with Islam's threat. His every action enables and emboldens our very worst enemies. None of that changes how a long-range plan must devise some sort of functional deterrent to terrorism. I submitted the bulk of my monograph on "A Functional Deterrent to Terrorism" to The Belmont Club some time back. Please scroll down to my entry at 6/19/2008 09:48:00 PM. I agree very much that Islamic celebration of death makes MAD (Mutual Assured Destruction) less effective. This is why, in the absence of targeted assassinations, I advocate responding to all future terrorist atrocities by using a policy of Massively Disproportionate Retaliation using conventional weapons. Be they elite or street level, enough Muslims need to perish whereby jihad loses its attractiveness. The death of many fewer elite Muslims would accomplish this but regardless of rank, it is a matter of sufficient numbers perishing such that it becomes an existential matter just as Islam's onslaught is to the West. All tecknologies have undesirable sideefects . All we can do is to try our best to minimize these undesirables. The returnflow of brine and the way it let out and diluted by the natural sea-currents is ione of the mayor design criteria for a welldesigned DSP. You have to imagine that we are talking gigantic volumes of seawater, almost ANYTHING that becomes diluted by a factor of a hundred million becomes unmesurable. After two years of fullvolume operations ,nobody have sucseded in measuring any harmfull effects OUTSIDE a radius of 0.5 km from the pipe end ,which is several km from the beach. Hopefully neewer generations of membranes will need less detergents. Thank you, ole, for your input. I now see that there must be a special extra operational energy budget assigned to DSPs that accounts for the work required to intake and expel large quantities of unprocessed sea water that has the residual brine entrained into it. Although requiring more fuel, this dilution method would minimize salinity impact upon the areas surrounding these facilities.